abbreviation for echo planar imaging. The production of a picture, image, or shadow that represents the object being investigated. In diagnostic medicine the classic technique for imaging is radiographic or x-ray examination. Techniques using computer-generated images produced by x-ray, ultrasound, or magnetic resonance are also available. Imaging of arterial walls with magnetic resonance for evidence of atherosclerosis. Blood flow normally gives off a bright signal during magnetic resonance imaging but can be made to appear dark to distinguish it from the walls of the surrounding blood vessels. This enhancement in magnetic resonance imaging can be used noninvasively to show where arteries are obstructed and to determine the components of the plaque in those arteries. Radionuclide brain imaging performed after a tracer molecule is injected angiographically into a blood vessel that supplies the brain and the tracer allowed to equilibrate (achieve a steady state) in the brain's arteries and veins. An imaging technique in magnetic resonance imaging to identify the unique directional movement of molecules, esp. water molecules, along muscle and neural tracts. One of its uses is to identify the linkages and structures of white matter tracts in the brain. In magnetic resonance imaging, the use of changes in the movement of water through tissues as a contrast medium. Diffusion weighted imaging has been used in the diagnosis of strokes and other neurological diseases as well as abdominal and musculoskeletal injuries and diseases. The capture and production of an image of an object, either on film or on a computerized display, where it can be reformatted and analyzed. Commonly used imaging modalities include x-rays, ultrasound, and magnetic resonance. In radiology, the use of electronic means to subtract portions of the radiographic image in order to better visualize the object. A form of ultrasonography that incorporates both gray-scale imaging for the architecture of the tissue and a color Doppler signal for flow or movement within the tissue. A fast magnetic resonance imaging technique in which an image is acquired after a single radiofrequency excitation. A means of mapping the electrical activity of organs such as the brain or heart to diagnose or treat diseases such as seizures or dysrhythmias. ESI relies on the collection via external sensors of the electrical activity generated by multiple tissue sites within an organ, and the mathematical manipulation of that data to localize areas where patterns of electrical conduction are blocked or excessively active. The identification of metabolic activities during MRI studies of the brain. During an fMRI, magnetic resonance images of the brain are made while the subject performs specific tasks, e.g. using certain fingers or saying particular words. The study helps identify changes in blood flow during these activities, as well as changes in brain chemistry or the movement of water molecules in neural tissues. It is used to study brain injuries caused by cancer, multiple sclerosis, strokes, and trauma. Any combination of radiological technologies for generating images of body structures. Fusion imaging includes positron emission tomography-computed tomographic (PET-CT) scanning, CT–magnetic resonance fusion imaging, and single photon emissions computed tomographic (SPECT) fusion imaging. Radioisotopic imaging of the heart, esp. of the muscular contraction of its walls and of its ejection fraction. Red blood cells are withdrawn and labeled with an isotope of technetium. A sequence of images is taken immediately after the radiolabeled blood is reinjected into a peripheral vein and allowed to circulate. The images are timed to begin with each ventricular depolarization (with each R wave of the electrocardiogram). Normally the ejection of blood from the heart occurs at the same time and with the same strength from all muscle segments. Areas of the heart affected by infarction may not move normally (they may be akinetic or hypokinetic) or they may move paradoxically (they may be dyskinetic, as when a ventricular aneurysm is present). 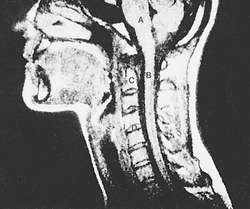 MAGNETIC RESONANCE IMAGING: MRI of the cervical spine, sagittal view. Imaging that uses the characteristic behavior of protons when placed in powerful magnetic fields to make images of tissues and organs. Certain atomic nuclei with an odd number of neutrons, protons, or both are subjected to a radiofrequency pulse, causing them to absorb and release energy. The resulting current passes through a radiofrequency receiver and is then transformed into an image. This technique is valuable in providing soft-tissue images of the central nervous and musculoskeletal systems. Imaging techniques allow visualization of the vascular system without the use of contrast agents. Agents such as gadolinium are available for contrast enhancement but must be used with caution in patients with renal insufficiency. Magnetic resonance imaging is contraindicated in patients with cardiac pacemakers or ferromagnetic aneurysmal clips in place. Metal may become damaged during testing; therefore, health care providers must establish whether the patient has magnetizable metal anywhere on or in the body. Patients should not wear metal objects, e.g., jewelry, hair ornaments, or watches. Patients who have had surgical procedures after which magnetizable metal clips, pins, or other hardware remain in the body should not have this imaging. Some patients with tattoos or permanent cosmetics should also avoid MRI because of the risk of burns. The use of radioactive isotopes, such as 201Tl or 99mTc sestamibi, to gauge the blood supply and viability of the regions or walls of the heart. MPI is frequently used to assess patients with coronary artery disease, often in conjunction with exercise tolerance tests. A patient with a coronary artery that is almost totally blocked may take up only a small quantity of radioisotope during exercise but much more of the tracer after several hours of rest. By contrast, heart muscle that is fed by a completely blocked artery will take up no radioisotope either during or after exercise. Imaging of tissues within the body after they are bound by fluorescent molecules and stimulated with light in the 700-900 nm wavelength range. NIRI is used to provide images of solid cancers, bone and joint inflammation, and blood flow to tissues. In radioisotopic imaging, the use of differences in blood flow through organs as a means of diagnosing diseases such as strokes or malignancies. Imaging of the functions of an organ, i.e., of its blood flow, electrical activity, metabolism, oxygen uptake, or working receptors. A means of assessing asthma in which a magnetic resonance image is made of the lungs after a patient inhales polarized helium gas. Asthmatics have ventilation defects in the lungs that are not present in nonasthmatics. Imaging to determine whether an infant has gastroesophageal reflux. Radioactively labeled milk is given to the child orally, and the progress of the milk through the upper gastrointestinal tract (and in reflux, into the lungs) is monitored. The scan is typically used if an infant has had more than one episode of aspiration pneumonia. Measurement of the caliber of the blood vessels in the retina as risk markers for coronary and cerebrovascular disease. Narrowing of retinal arterioles has been correlated with an increased risk of diabetes mellitus and coronary artery disease. Dilation of retinal venules has been associated with an increased risk of stroke. Measurement of the size of specific structures within the brain with magnetic resonance imaging or other devices. It is used to diagnose and identify brain diseases noninvasively. 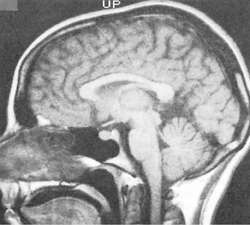 Atrophy of certain anterior brain structures is found in patients with frontotemporal dementia. In schizophrenia, the hippocampus and amygdala are reduced. Other findings have been demonstrated in depression, fragile X syndrome, Rett's disease, Tourette's syndrome, and other neurological disorders. She shared with the participants that in compliance with the directives of the Prime Minister, polio infrastructure will be merged with EPI in coming months to strengthen routine immunization in the country. the EPI program as many of the pharmaceutical companies have already stopped production of certain vaccines available under EPI - Pakistan and its provinces. The EPI technicians and class-IV employees warned of taking to the streets if they were not paid salaries by next Friday. The EPI packs cost 50% less compared to the standard retail price at a national retailer. Because the EPI focuses on items bought on a repetitive basis, such as food, the EPI can be seen as being more relevant for everyday price changes affecting consumers. With the signing of the contract, IDC will now be involved with EPI to ensure the readiness of the site for the arrival and assembly of the drilling equipment. CG: This grant will enable EPI to expand our technical assistance through media outreach events, distribution of emergency preparedness materials through our annual National Mail Distribution Project, as well as the creation of a comprehensive personal preparedness DVD that will be fully accessible for people with disabilities. This can lead to a secondary condition that is common in many EPI dogs, called SIBO (small intestinal bacterial overgrowth). The shirts sold fast, and we donated the $250 we raised to EPI. EPI has reduced morbidity and mortality from vaccine-preventable diseases in Bangladesh, but little is known about costs and effectiveness of urban EPI. For example, incorrect cord distribution that reduces the average EPI in the center of the fabric and increases the EPI on the outer edges will affect fabric weight and thickness. EPI is a nonpartisan, nonprofit organization that focuses on the economics of working Americans.